In this same year, Isabelle Huppert starred in Mia Hansen-Løve's Things to Come/L'avenir, her searching, elegant film about a philosophy professor whose life is crashing around her, and the Paul Verhoeven's flashy, boldly vulgar comeback, Elle, which became one of Huppert's biggest hits. Souvenir, a little musical trifle by a young Belgian director, Bavo Defurne, about an aging singer's comeback and romance with a young boxer, was a break for Huppert from more challenging things, a palate cleanser after up after meatier stuff. Similarly she made the minor 2010 Copacabana to ease off after working with Claire Denis on the intense, scary White Material the year before. This movie is so calm it's almost asleep. Its charm can't keep it from seeming a wan trifle. But it's got Huppert. 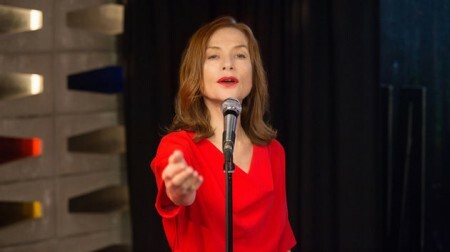 Huppert's character, Liliane, whose stage name was Laura, was high up in the Eurovision pop music competition one season many decades before. She had a following. Too bad for her it was the same year ABBA was in the running. She never made it back. Now she stands in the assembly line and applies leaf and berry garnishes on pots of paté at the Porluxe charcuterie factory, going home of an evening to drink by herself in front of the television. She is a zombie; being Huppert, still looks rather good. A temp arrives at the factory, aspiring lightweight boxer Jean (Kévin Azaïs, a hot actor since the 2014 hit Love at First Fight /Les combattants; this is his seventh film since). Though he's only 21, Jean recognizes Liliane as Laura, a fan of hers himself through his dad. She denies her identity, then amiably accedes, letting Jean into her life, and her bed. As they become lovers, he prompts her to sing for his father's colleagues, then at some other small local venues. Afer Jean gets KO'ed in a match he shelves boxing and begins obsessing on a revival of "Laura." He pushes Liliane to enter the Eurovision pop contest again, with him as her "manager." While working on this demanding project, Liliane sneaks back to Tony Jones (Johan Leysen), her former husband, manager accountant, "my everything." He can create a good song for her, and turns out to be a judge of the competition, and quite willing to help. It's jarring at first to have to come to the realization that there's no secret behind Huppert's character, no malice, slyness, indomitable will . But we must remember that after all the remarkable, tireless actress is always something of an empty vessel. Here, though, a tuneful one. A low-keyed musical is something new for Huppert, who keeps on changing. Her singing voice isn't extraordinary, but it has subtlety and style. Her presence on the stage is that of a consummate pro. She uses stilted long-arm gestures to telegraph the meanings. It's all rather vieux jeu. But maybe the audience is ready for revival. The songs for the film composed by lounge music pianist Thomas Lauderdale, leader of the Portland band Pink Martini, are delicately pleasing, designed for singing along. Director Defurne and an associate wrote the French lyrics to go with them. Her key song for the competition, "Jolie Garçon" ("Pretty Boy"), so catchy it has the audience chanting the refrain, could be a homage to Jean: "arms of cement..." it goes. He likes to show off his biceps to her. ("Joli garçon, je dis oui/Bras de béton, je dis oui..."/Arms of concrete/ I say yes/ Heart of candy/ I say yes). Is there reason to fear Liliane may falter at the brink of her renewed success, long later, or that her seamless romance with the nice young boxer, with his feathery mustache, might not survive? Or might it, after all? This movie doesn't care. It's just a little diversion. The more profound or exciting dramatic possibilities of the action are not broached. Souvenir has some charm, but no strong ambition. It's on to the next, bigger Isabelle Huppert film. And Kévin Azaïs, too, will go on to bigger, more important films. If you want a palate cleanser yourself, this works; if you like to keep up the blood pressure, avoid. Souvenir, 90 mins., debuted at Angoulême and Toronto in August and September 2016, showing in half a dozen other international festivals. It opened in France 21 Dec. 2016 to very mixed reviews (AlloCiné press rating 3.0; viewers rating a paltry 2.0). It has been bought by Strand Releasing for US distribution and opens theatrically in New York at Quad Cinema and Los Angeles at Laemle's Monica Film Center on 2 Mar. 2018.